You may not be familiar with tonsil stones but they are a very common complaint and there is a good chance that you have experienced them without even knowing about it. When we think of stones, we are more likely to think of the kidneys or gall bladder but your tonsils can also develop painful stones. These stones which are known medically as tonsilloliths or tonsil calculi usually occur when debris and bacteria accumulates in your tonsils before hardening and forming small calcified lumps. Bad Breath: Foul smelling breath or halitosis is one of the best indicators that a person has tonsil stones. If you have tonsil stones, there is a good chance that your breath will contain sulfur compounds causing the breath to smell extremely bad. Research shows that 75% of those with abnormally high levels of sulfur compounds in the breath are suffering from tonsil stones. Sore Throat: It is sometimes difficult for doctors to determine the cause of a sore throat especially when tonsil stones occur at the same time as tonsillitis. However, the tonsil stone alone can cause throat pain and discomfort around the area that it has lodged. Visible White Lumps: Tonsil stones may or may not be visible by simply looking at the throat. Sometimes you can see a solid white mass but they are often hidden inside the tonsil folds. When they are hidden, they can only be detected with a medical scanning technique like a CT scan. Trouble Swallowing: Depending on the size and the location of the stones, they may cause great difficulty or pain when you try to swallow. Swollen Tonsils: The tonsil stone or an infection caused by the tonsil stone may cause your tonsils to swell. Ear Pain: Because the nerves share pathways, a person with tonsil stones may also experience ear pain. The tonsils are a prime location for developing bacteria and trapping debris. They are made up of numerous nooks and pockets where debris can build up and bacteria can take hold. Tonsil stones occur when the debris becomes hard and calcifies. It is more usual for this to happen in people with repeated bouts of tonsil inflammation or tonsillitis. Small tonsil stones occur fairly commonly but it is much more rare for a person to experience a large, calcified tonsil stone. Conventional treatment for tonsil stones depend on the size of the stones and the symptoms they present. In cases where there are mild symptoms, medical treatment is not necessary. In some case, doctors can prescribe a course of antibiotics or suggest surgical removal. Another option is laser resurfacing or laser cryptolosis which involves reshaping your tonsils to reduce the areas in which stones can develop. If you are suffering from mild symptoms and would like to try to treat your tonsil stones at home, there are a number of safe and effective remedies that you can try. Garlic is one of the best home remedies for treating your tonsil stones. It has very powerful antibacterial properties that can help treat the stone itself, reduce the risk of further infection and treat other symptoms such as foul smelling breath. Simply chewing on a clove of garlic each day can have a very beneficial effect. It may have an extremely powerful odor of its own but it can help destroy the bacteria that is causing your bad breath. To get the most from your garlic, it is best to crush a clove and allow it to sit for a ten minutes or so before popping it in your mouth. Crushing the clove helps to release its main active component – allicin which is responsible for garlic’s highly antimicrobial properties. Apple cider vinegar seems to find its way onto many of our home remedy lists and here is yet another use for this remarkable substance. Apple cider vinegar contains excellent antibacterial agents that can help treat and break down your tonsil stones as well as some of the other symptoms like halitosis. To treat your tonsil stones, add a tablespoon or so of your apple cider vinegar to a glass of warm distilled water. Use the solution as a gargle 2 or 3 times a day. Simply the act of gargling can help to dislodge the stones. As Is mentioned earlier, the simple process of gargling vigorously can help to dislodge your tonsil stones. If you add salt to the gargle mix, then it can also help destroy bacteria and keep your breath smelling clean. Add half a teaspoon of plain table salt to a glass of lukewarm water. Gargle vigorously with the solution two or three times a day. Oil pulling is a natural remedy that remains very popular in Aurvedic medicine. It is a great way to detoxify the mouth and take care of your oral hygiene in general. It is also an excellent natural remedy for tonsil stones. Oil pulling involves swishing your mouth with a tablespoon of an oil. The preferred oils for this treatment are coconut, sesame or olive oil. Simply take a tablespoon of your chosen oil and use it to swish around your mouth for 10 minutes or so. After you have finished swishing the oil thoroughly around your mouth, spit it out then brush your teeth as normal. This is a common treatment for various oral issues including tooth decay and gingivitis. It helps detoxify your mouth and helps eliminate bacteria. It also helps alleviate the other symptoms of your tonsil stones such as foul breath. Probiotics can help destroy the bacteria associated with tonsil stones and also other bacteria thriving in your mouth. You can buy supplementary probiotics or try to consume more probiotics in your diet. The best choice of food to get more probiotcs into your system include fermented products such as kefir, natural yogurt, kimchi and goat’s milk. It is important to make sure that you hydrate properly in order to prevent and treat tonsil stones. If your mouth is too dry and lacks sufficient saliva, it can allow bacteria to thrive. This in turn can encourage the formation of tonsil stones or allow them to become larger. If all else fails, then coughing fairly vigorously can help loosen and dislodge your tonsil stone. For many people, coughing up a stone is the first time they realize that they had them especially if they were not experiencing any other symptoms. Once you have coughed up a stone, you should gargle with clean water and salt to clean out your mouth and eliminate residual bacteria. If you are very careful and the stone is visible, you may be able to remove your tonsil stone yourself with a cotton swab. Wet the swab then gently push in the tissues surrounding the stone to help loosen it from the tissue. Try to place your swab as far behind the stone as possible so that when it pops out, it moves away from your throat to the front of your mouth. Try not to be too aggressive as this will further irritate your throat. Hopefully one of these remedies will work for you and may also help prevent future occurrences. 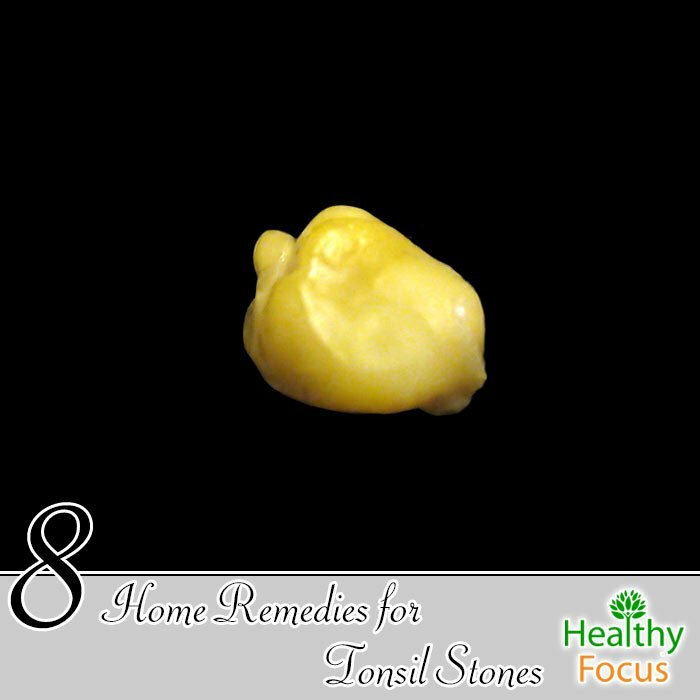 However it is important to mote that these remedies should only be used to treat small tonsil stones with minor symptoms. If you have a large, visible stone or you are suffering from swollen and painful tonsils, it is best to visit your doctor for expert advice.